The American Graded Stakes Committee may wake up to the reality that the graded stakes of summer and fall for 3-year-old horses fail to meet the criteria of grade I competition. But it’s likely the committee won’t. The grade II Jim Dandy was recently moved up in class and the horses assembled probably suit the description. But the same grade II horses will return for the Travers (gr. I) and suddenly, they’ll assume loftier status. Nevertheless, Alpha is a perfect two-for-two at Saratoga and has won half of his eight races. The meet’s leading jockey, Ramon Dominguez, working for trainer Kiaran McLaughlin on behalf of Godolphin, kept the son of Bernardini a length ahead of the pack throughout all but the last yards of the 1 1/8 miles and then added another length to his lead at the wire. Now, it’s on to that shot at a grade I. In capturing the co-featured $600,000, Diana (gr. IT), Winter Memories, a pink daughter of El Prado, won her third race at Saratoga, her fourth graded stakes and her eighth race overall. She’s been amazingly reliable for trainer Jimmy Toner, coming back from the occasional set back in a fashion that’s fan-pleasing. Despite less than ideal weather, there were several other performances worth noting on the Saturday, July 28 card. Juddmonte had gotten what it wanted from the well-bred Raison d’Etat only once in eight previous starts, but on Saturday the 4-year-old A.P. Indy colt delivered. He looked like the French foreign policy, moving right, moving left and moving right again in the stretch, but those who stood to prosper from him did. In the second race, Ken and Sarah Ramsey were blessed by Charming Kitten in her very first start. In the third race, the red hot Starlight Stables produced another 2-year-old winner in Lawn Man. Both horses were trained by Todd Pletcher. Lots of people who come to Saratoga for the races leave well before the feature race. Sitting in a lawn chair with dust between toes is okay for awhile, but at about the time the rains typically come, which is late afternoon, patience becomes challenging, especially if you can watch the action on television. 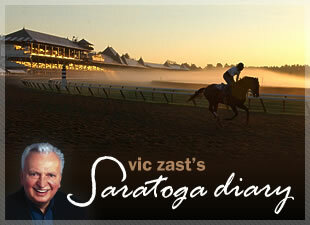 Last summer, NBC Sports televised feature races from Saratoga throughout the meet. But, this summer, there are the London Olympic Games and horse racing fans know all too well what has priority. That probably explains why so many stayed for both stakes. The crowd numbered 24,548, considerably fewer than the same day last year.